That’s what Tom and I have become…. again. It’s not our own weight that we’ve been watching – neither of us need to do that – it’s our baby’s weight that we’ve been watching. Oh and we’ve also been on nappy watch – you know you’re a new parent when you get so excited about the contents of a wet and/or dirty nappy! These are two of the indicators that a baby is getting enough food and is growing healthily. We’ve been here before, when Andrew was a baby. He lost a lot of his birth weight (nearly 20%) in the first 6 days of life outside the womb. Although he initially put quite a bit back on when we started supplementing with formula as it took about 2 weeks for my breast milk to ‘come in’, it took him until almost a month old to regain his birth weight. After that his weight crept up very slowly for the next couple of months, only gaining an ounce or 2 a week instead of the average 6 ounces a week. This meant that he wasn’t following the curve that is charted on the growth graphs which come in the little red book that each baby in the country is given at birth, so the health visiting team can record their progress. 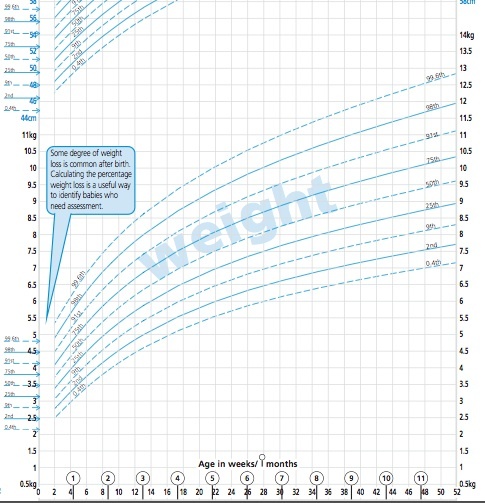 If a baby is following the curve of the graph, whether that be at the 98th percentile line or the 2nd percentile line, it’s recommended that you get them weighed about once every month. If they are not following a curve, you’re told to get them weighed more often. Andrew was on weekly weigh-ins until around 2.5 months, because he was creeping up so slowly and was lingering around the bottom of the chart. He never lost weight from one week to the next, but he wasn’t putting it on fast enough to follow the infamous curve. At the time I found these weekly weigh days very stressful. I felt like there was a lot of pressure from the health visitors at the clinic to get his weight up, and I felt like a bad mum if he hadn’t gained enough each week to satisfy them; I used to dread putting him on the scales and could hardly look at the numbers settling down to give the final answer of a weight as he wriggled and cried at having no clothes on, poor thing. Even though my milk was supplemented with formula, I felt as though I was demand feeding as well as I possibly could, with the help of the SNS, so surely if his weight wasn’t going up according to the charts, that was at least partly just his way of growing, even if it didn’t conform to the curve. 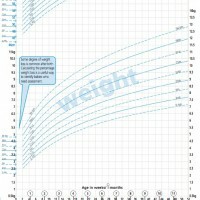 This is what a blank weight chart looks like. This blue one is for boys, and girls get a pink one - nothing like a good old bit of perpetuating gender stereotypes. Once he started eating solid foods alongside breastfeeding, the story changed. He soon started to climb up the curve much quicker, and suddenly made up for the slow start. We went from fortnightly to monthly weigh-ins, and the last one he had (until recently) was at his 1-year health check, as after that I was completely confident that he was putting weight on and growing well, just by looking at him. Out of interest, I had him weighed one day when the health visitor came round to weigh Joel, and he was just over the 75th percentile line. Fast forward to now, and here we are with our second baby, weight watching again. Joel lost less weight at birth, and regained his birth weight within the 2 weeks that they like them too. A tick in the good parent box for us. He continued to gain well for about 8 weeks, cue more ticks in the good parent box, though he did drop slightly across the percentile lines on the chart. But the GP we saw for his 7 week check wasn’t concerned about this, as he’d always gained a decent amount each week and hadn’t plateaued off like Andrew had by that age. Once I did get quite annoyed by a comment from a health visitor at the weighing clinic when I put him naked on the scales: “He needs to fill out a bit”…. I’m sorry? “Fill out a bit?” I think you’ll find that’s just the way he is, he’s always been long and slim, and you should take a look at his dad!! It was like Joel heard what the doc said though, and the next day he hit a massive growth spurt and guzzled milk like there was no tomorrow for a few days. Thankfully for me the milk machine, it settled down again, and by the time he was weighed the following week, he’d stepped up a good amount on the chart. Not sure if I got a tick in the good parent box for that, but I felt like I’d done a good job that week at least. A couple of weigh-ins later, and we’re now back to the normal monthly weigh-ins that all babies should get (if their parents listen to the health visitor); I guess we’ve got enough ticks now. I feel happier now that we’re under less pressure for the time being, as I don’t want this to overshadow my enjoyment of looking after my boys, which I really love. Often I find myself wondering at what age being tall and slim goes from being undesirable to desirable. According to society, babies are supposed to be chubby and adults are supposed to be slim. And why should all humans grow to the same curve? I never thought biology was that exact. Maybe my babies grow to a more step-like graph that starts off with slower weight gain than the average baby – if they are anything like me, and I believe genetics predisposes them to that, they won’t be “normal”, and what is “normal” anyway – average? Not everyone can be average, there need to be some people at either extreme from which to calculate the average. I understand that weight can be one indicator that a baby isn’t thriving, but I really wish that our medicalised society would look at the broader picture – my babies have always been very alert and active, reaching all their milestones at least on time if not earlier than average, and have generally been very happy as far as babies go. Plus, remember what I said about nappies up there? No problems in that department at the moment! Surely these things count when assessing if a baby needs medical attention or more artificial infant milk? To be fair, not all health professionals that we have met have clung so rigidly to the chart culture, and Joel’s health visitor has genrally been very positive when she’s come round to see us – it’s more the ship-em-in-ship-em-out clinics that I’ve found so annoying. Oh I am so sorry you’re having this stress again! Oscar was only ever weighed in first 2 weeks and then at 8 months… we never went to the clinic (my health visitor said there was no concern because he had regained his birth weight, and more, within those first two weeks.) I possibly should have gone when I started having the feeding issues, but I never did. My health visitor actually said she thought that it was quite “arrogant” of her profession to think they knew best all the time and that figures like weight were everything… sure if baby is losing weight then it is a worry, but if baby is happy and healthy, what does that matter? Oscar was on 75th percentile at birth… he went up to around 98th very quickly and is now around 91st (based on my own rough measurements once in a while out of curiosity). He is large for his age and always has been… slim, but tall, with big hands and feet! With his rapid weight gain early on (possibly due to oversupply? I don’t know!) I’d have probably been told I was “overfeeding him” had we gone to get him weighed each month!!! Thanks Amanda. I think this time I’m just accepting it more and not allowing it to get to me as much. I hope my humour in the post came across as that’s just how I’m seeing it now. Having been through it once already, and seeing what a healthy boy Andrew clearly is, I know there’s nothing to worry about. It was harder to convince myself and others of that as a first-time mum. I couldn’t believe the ‘he needs to fill out’ comment – Tom never filled out his entire life so far! All babies are different. Joel is long and slim, also with big hands and feet, but currently on 9th having been born between 25th and 50th. Andrew was born right on 50th, dropped to 9th and then up to 75th now. So they are pretty similar so far, though I think Joel is even more elongated than Andrew was at this age! Ha yes, I bet you’d have had it the other way – I know someone at LLL who was told she should feed her baby less as she was on 98th – ridiculous! I just wanted to write my thoughts on this down, and I know I’m not the only one who’s had this experience, so hopefully it can help others to know they are not alone.